Plastic worms are a deadly weapon when targeting bass in the Summer. When the bite is slow, throwing plastic worms into structure is one of my most productive patterns. In the Summer I like to find isolated structure on shorelines which includes lay-downs, vegetation and boat docks in water no deeper than 6 to 7 feet. I mostly fish them in a non-traditional way, with a heavy 3/0 hook and a swivel, but I do not use any weights. The heavy hook and swivel gives the worm the perfect fall speed to mimic dying prey. You need patience when finesse fishing. Flukes, jerkbaits, and topwater frogs all entice what is called a reaction strike. This means the bass hit the bait out of pure instinct. Fishing plastic worms is the polar opposite. Worms produce a hunger strike, which means the bass are striking the lure because they see an easy meal. Here are some secrets to my minimalist approach to fishing soft plastic worms. Scent plays a key role when finesse fishing. I suggest fishing with plastics which have scents built into the worm, such as the Berkley Powerworm. If your plastic baits do not have any scent, try adding your own. Liquid Mayhem makes a great scent that can be added to any bait. After the cast, let the worm slowly sink to the bottom. While the bait is sinking, reel in the slack of your line until you have only 2 or 3 feet of open line, all the while keeping your rod tip low. After a few seconds, reel in the few feet of additional slack until the line is tight, then raise the tip of the pole vertically until the rod is straight up in the air. This brings the worm off the bottom. Again reel in the slack with your rod tip low until you have just a few feet of slack, then wait. I watch where the line meets the water – it’s the most effective way to spot a hit. When you see the line move away from you, reel in the rest of your slack quickly and make a solid hook-set. Make sure you keep your rod tip low, it's very difficult to set the hook properly when the rod tip is high in the air due to not having enough range of motion. I also like to hold the line with the tip of my index finger - this helps me feel bites that are small and I cannot see visually. This is very helpful when fishing in windy conditions, because the wind blows the line around in the water which gives the impression of a bite. When raising the rod tip, hold the line so you can feel if the worm is getting pulled through any grass or structure, which sometimes feels like a bite, only the line goes slack after the initial thump. Buff USA makes some fantastic fishing gloves that help with sun protection but also leave the tips of the finger area open. When fishing a plastic worm Texas rigged, slightly tuck the point of the hook into the bait. This prevents the hook from slipping down. When the bait is exposed, it will cause grass and other plant-life to snag. Trust me, this will not interfere with the hookset. Spinnerbaits have gradually declined in popularity over the years, a fact that you can take advantage of. Spinnerbaits are another reaction strike lure, but they have one advantage over all the others - no treble hooks. Throwing spinnerbaits around fallen trees is my favorite approach. Let the bait sink 4 or 5 seconds, then use a fast retrieve in. Try to cast it around sunken tree limbs. Once your bait hits the structure, let it flutter down a few seconds before retrieving again - this will often cause a strike. Trailers are a good idea when fishing spinnerbaits as they provide a better profile area for the bass to target during a hit. I also like to use them where there is a lot of vegetation. Since this bait has no treble hooks, weeds and other debris are less likely to hang up on the lure, which makes a spinnerbait one of the most versatile options in your tackle box. It is important to find a spinnerbait that runs correctly in the water - I have used some in the past that turn sideways on the retrieve. Nichols Lures makes a great handmade spinnerbait that is guaranteed to run correctly straight out of the package. There are many different sizes and blade styles of spinnerbaits, but again, I take a minimalist approach and usually choose a single Colorado Blade 3/8oz in size. I try to "match the hatch" when it comes to color unless I am fishing at night, then I pick a midnight blue or black. Spinnerbaits are also one of the few baits I reel in all the way to the boat because it is common for strikes to happen right before I lift the bait out of the water to recast. Many anglers will not use a spinnerbait and a swivel at the same time due to the spinnerbaits not having a closed eye. They think the swivel will slide down the shaft of the bait causing it to not retrieve correctly. To avoid this, let the bait sink while you reel in the slack, then jerk the bait before you start the retrieve. This will ensure the correct swivel placement, which helps reduce line twist and does not interfere with a true retrieve. Take advantage of summertime. 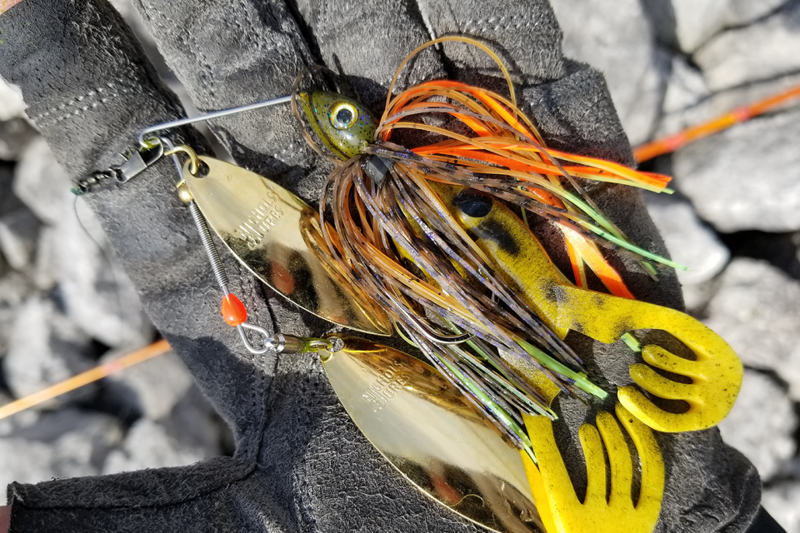 Since virtually every item in the tackle box is fair game in the summer, try stepping out of your comfort zone by experimenting with different products, colors, techniques, patterns, and locations. Try to learn something new each time you are out on the water, regardless of the fishing results. Pay close attention to the surroundings. Look for birds, schools of baitfish that hit the surface, a blow up 300 feet away from you - all these things can lead you to fish. When I see fish hit the surface I immediately move to that location. Always have your eyes and ears open when you survey the water. Move to new locations quickly, give 2 or 3 baits 2 or 3 minutes each before changing areas. Avoid lakes that have a heavy population of carp and catfish. Carp and catfish like to eat the eggs of spawning bass, leading to below average numbers. Also avoid lakes with heavy recreational use, especially if the lake is shallow. Most of these bodies of water will be dirty from the high volume of motor boats. Fish the Magical Hour. The Magical Hour is a term I invented to describe the hour right before sundown. I notice a huge influx of activity on the surface, so locating bass chasing schools of baitfish is very easy. It is absolutely the best time of day to fish in the Summer. Use a swivel. Unless you are tournament fishing and have multiple rods with you, use a swivel. Swivels give you the advantage of being able to change baits quickly, plus they reduce line twist. I have never not landed a fish due to a swivel malfunction. I also use 30 lbs Power Pro braid for 90% of my setups - I think line visibility is highly overrated. I love to share my knowledge with fellow anglers, but even more I want to learn new things about bass fishing to constantly improve my abilities. Thanks Deeper for giving me this opportunity - I only support companies that I have used and highly believe in, and Deeper is at the top of my list. To continue this conversation, please follow me on Twitter at @Ohio_Bass and on Instagram @Ohio_Bass_Outdoors.